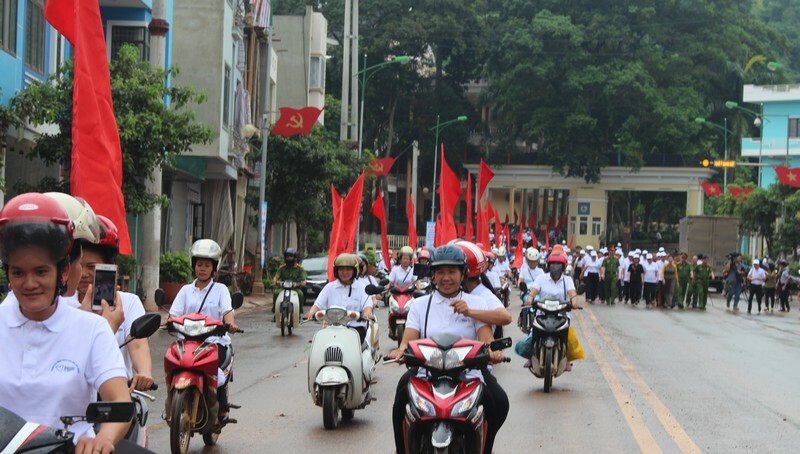 This is the message from the campaign on the occasion of the National Day Against Trafficking in Persons – 30 July organized in Son La city on the morning of 28 July 2018 by the Vietnam Women's Union (VWU) in coordination with the Ministry of Public Security and the People's Committee of Son La province. The event was attended by more than 600 participants. Between 2011 and 2017, authorities detected and dealt with nearly 2,800 human trafficking cases with more than 4,100 perpetrators and 6,000 victims, 92% of whom were women and children. Most of the victims are unemployed or underemployed residents of rural, remote and border areas. Trafficking in persons has been strictly dealt with in Vietnam recently. The VWU has actively carried out communication to raise women’s awareness about trafficking and supported local women with livelihood initiatives so as they can settle stably in the localities. In particular, in collaboration with the Border Guard Command, the VWU’s program "Hand in hand with women of border areas" for 2018-2020 periodimplemented in more than 110 border communes will raise women’s awareness and support women’s sustainable livelihoods, which helps reduce the likelihood of women’s illegal migration for employment and marriage. 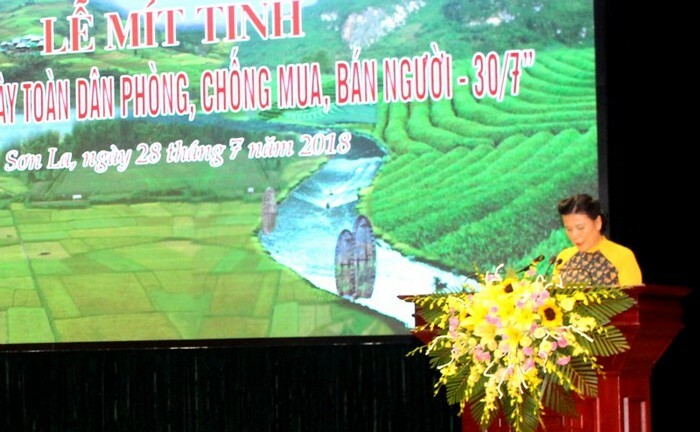 Addressing at the opening ceremony, VWU Vice President Nguyen Thi Tuyet proposed ministries, local authorities and other mass organizations continue to cooperate with the Women's Union at all levels for stronger efforts in preventing and combating trafficking; focusing on communication and awareness raising on safe migration,counseling forwomen on the procedures when go working abroad and getting married with foreigners, and assisting the returned victims of trafficking. 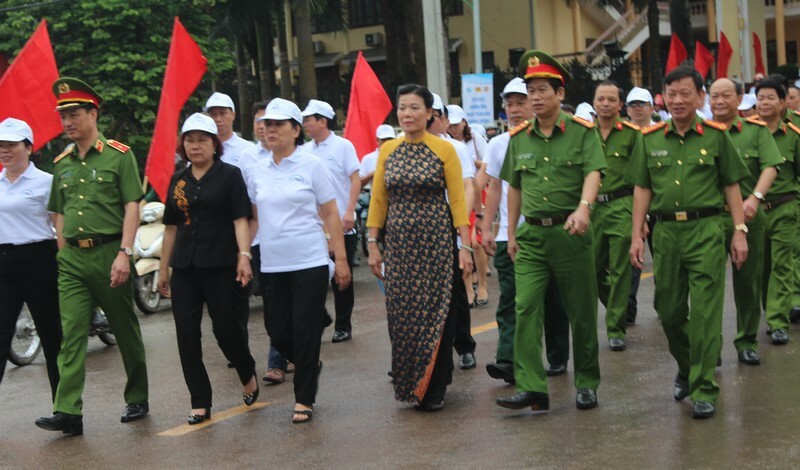 Speaking at the event, Major General Nguyen Duy Ngoc - Deputy Director General of General Department of Police, Ministry of Public Security - and Mrs. Trang Thi Xuan - Executive Vice President of the Provincial People's Committee - affirmed their strong commitments to fight trafficking in persons. 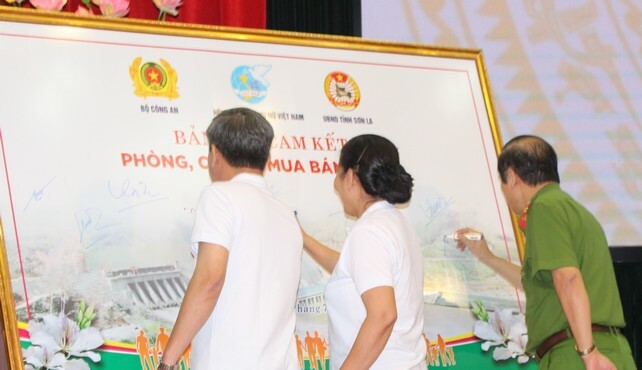 At the ceremony, participants from the VWU, Ministry of Public Security, leaders of Son La and some other provinces signed the commitment to show their responsibility and determination to jointly stop human trafficking. A parade of the mass was held at the end of the ceremony along the main streets of Son La city. 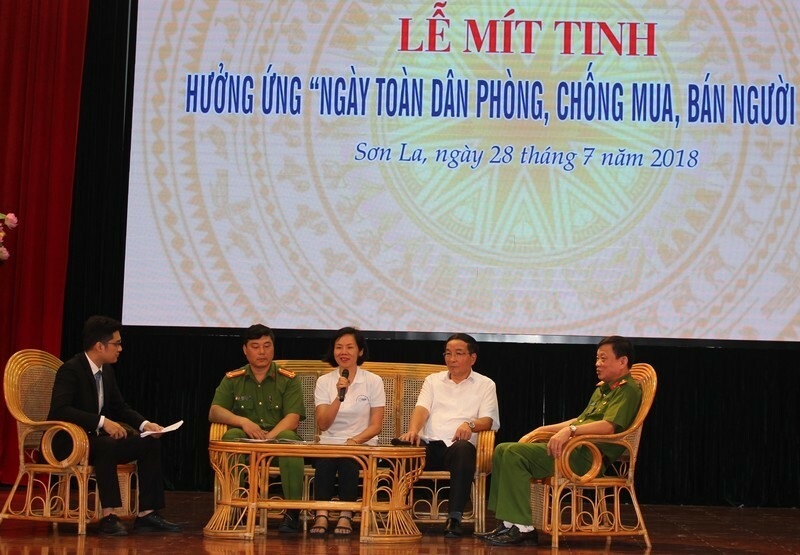 Also on this occasion a photo exhibition titled "All people unite to build cultural life contributing to the prevention and control of human trafficking" and a workshop on" Solutions for preventing and combating human trafficking through illegal migration" took place in Son La on July 27th.